Hudson Valley Harvest's mission is to provide access to local, healthy foods and to help and support their farm partners. 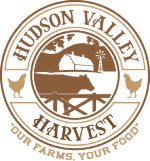 Hudson Valley Harvest further packages and processes products directly from some of the very best farms in the Hudson Valley. They are focused on purchasing only from farms that are environmentally responsible and nutrient dense, which leads to the sweetest and most delicious food.